Now that you have finally started the gym of your dreams, you will need a nice place to store all of your free weights. The last thing you want is your dumbbells and kettlebells lying all over the floor and causing accidents. In this post, we tell you about the best dumbbell racks on the market to help you get started. Made from durable material, the Titan Fitness Tier 2 is a solid dumbbell rack. It is an excellent choice for a home gym and can accommodate up to 10 dumbbells. 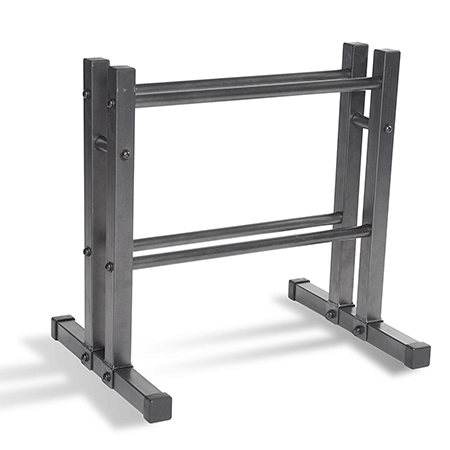 The rack is 22.5 inches high and 25 inches wide, offering a maximum capacity of 500 pounds. As such, you can mix and match dumbbells of various weights. Each tier allows for a total storage weight of 10 inches. 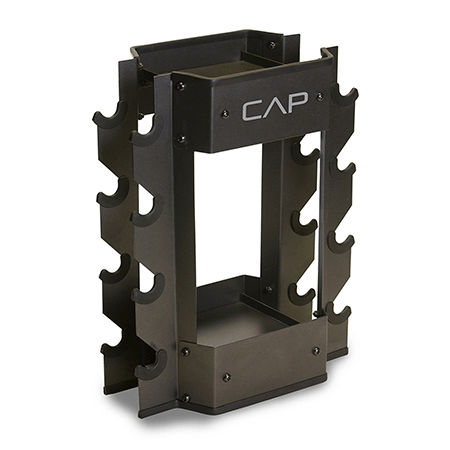 This is an outstanding product design from Cap Barbell that combines function with style. All of this is achieved without compromising durability and safety. Stainless steel is used for construction to ensure a safe and secure environment for storage. 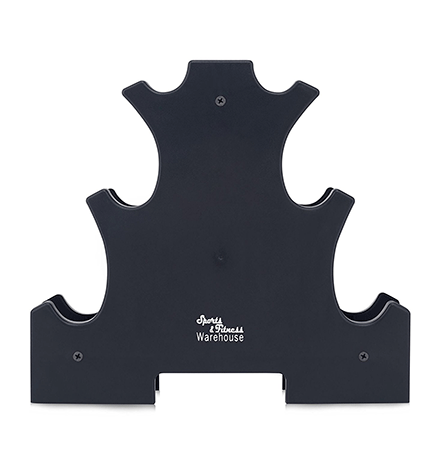 The rack features rubber grommet trimmed dumbbell cradles that do a fine job of preventing scratches. You can use the RK-CB16H to store up to 4 dumbbells or utilize the shelves for additional accessories like a water bottle, workout towel and more. Its maximum weight capacity is 225 pounds. 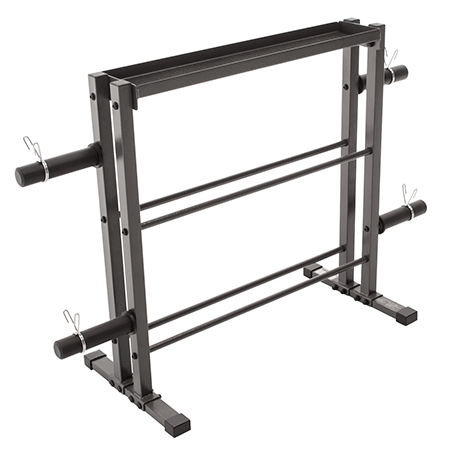 The Marco Combo Storage Rack will hold your dumbbells, plates, kettleballs and more. Main highlights include Olympic sized posts as well as three tiers of solid steel. The four posts can hold Olympic sized plates. 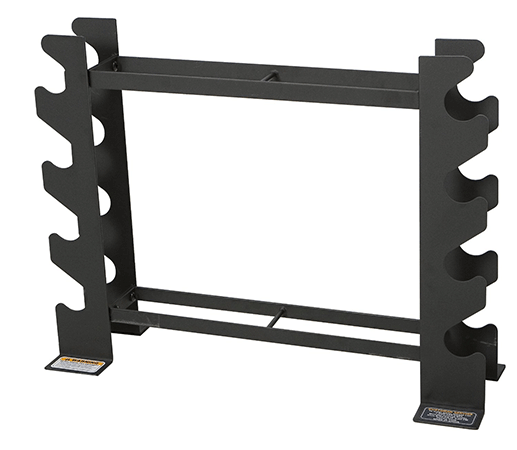 With a total weight capacity of 1000 pounds, you can rest assured that this rack will hold your weights. The rack has rubber feet that help protect your floors. What’s even better is that the whole body is covered with powder coated finish to prevent stains. Keep all of your weights in an organized manner with the Cap Barbell 24″ utility rack. The rack doesn’t take up much space and has two tiers where you can fit your free weights as well as other exercise equipment. It is constructed from solid steel that allows for a maximum weight capacity of 300 pounds. 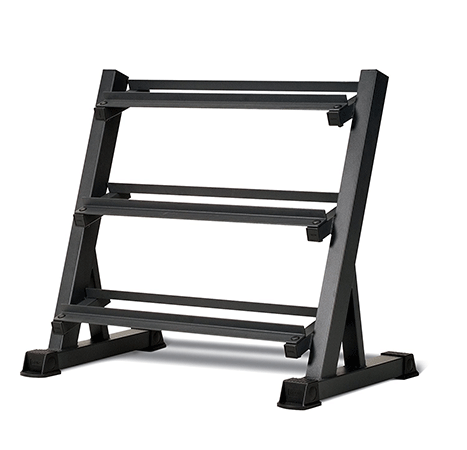 The design of the rack keeps your floors safe from scratches and away from the workout area. This 3-tier dumbbell rack can be placed on a table and allows you to store up to three pairs of dumbbells. It supports a maximum weight of 32 pounds and can only be used on a hard surface, say a table or shelf. 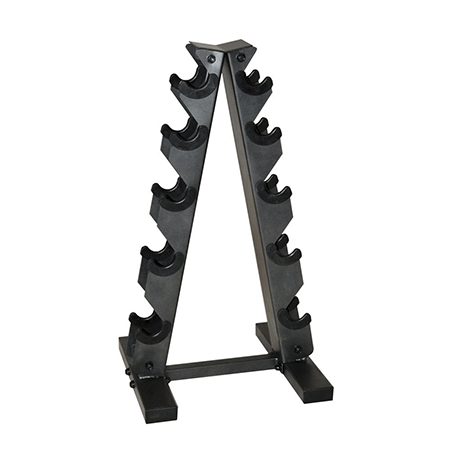 The rack features black, countersunk and long screws that allow for enhanced stability and look. Perhaps the best thing about the X-Mark Fitness dumbbell rack is that it features angled shelves that allow for easy storage and retrieval. It holds a complete set of 5-50 pound dumbbells, which isn’t easy to achieve at this price range. 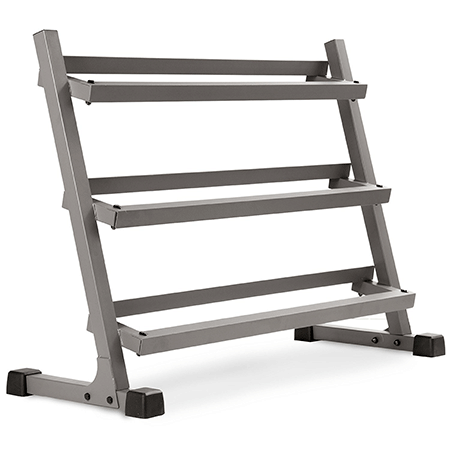 The rack is made from 14 gauge steel that’s covered with scratch resistant powder coat finish. A taller shelf lip holds the dumbbells in place more securely. The Cap Barbell RK-3D dumbbell rack has two tiers that can support a maximum weight of 500 pounds. 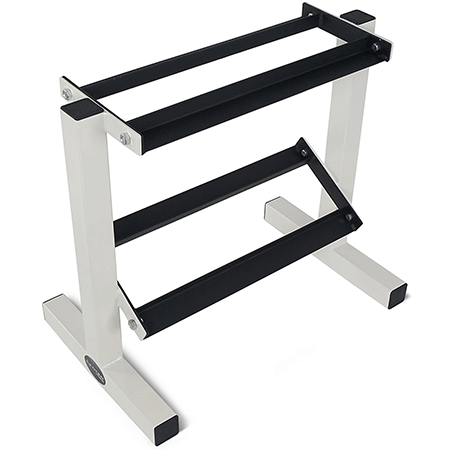 It is made from heavy duty steel and has a black/white finish. The angled lower level allows for easy lifting. This 50″ 2-tier rack is perfect for storing Chrome, Hex Rubber Coated, Hex Cast Iron as well as Pro-Style Dumbbells. Keep your free weights well organized and off the floor with the Marcy Multiple Dumbbell rack. This compact unit is made from 14-gauge steel and accommodates all dumbbells ranging from neoprene to cast iron. It is easy to assemble and measures 27″ L x 8.5″ W x 21″ H when complete. This racks holds up to five pairs of rubber hex, neoprene and cast iron dumbbells with a maximum weight of 200 pounds. Its small size makes it a good option for those who aren’t on the market for big racks or anyone living in a small apartment. It is relatively easy to assemble this rack. This 3 level dumbbell rack offers gym-quality construction home. 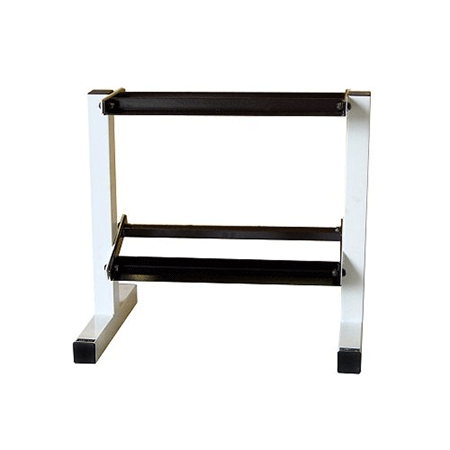 It has a heavy duty steel frame with powder coated frame. The rack accommodates all kinds of dumbbells and has an angle shelf design for easy storage as well as retrieval.